Industrial valve specialist AS-Schneider has developed a manifold specially for use on floating production storage and offloading (FPSO) vessels. The monoflange with dual double block and bleed function is noteworthy for maximum operational reliability and minimum weight – properties that are critically important in floating systems for extraction of crude oil and natural gas. AS-Schneider originally developed the manifold as a special solution for a renowned company from the energy sector. The company, which operated an FPSO vessel for offshore extraction of crude oil and natural gas, wanted to make its measuring equipment particularly reliable by using two double block and bleed valves in series. Moreover, it wanted to keep the weight as low as possible. A combination of two separate valves was ruled out owing to the great inherent weight and resulting susceptibility to vibrations. AS-Schneider’s product designers therefore set to work to find a way of mounting six valves – and therefore a dual double block and bleed function – in one valve body. 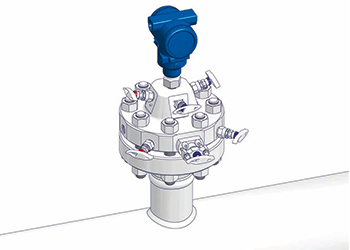 For this purpose they optimised the arrangement of the valves and the design of the connecting flow paths. The result is a monoflange with six integral valves which weighs only slightly more than a normal standard flange. The hook-up is therefore insensitive to oscillations and vibrations. As only one valve body is required, the risk of leaks is also low. It was therefore able to comply fully with the customer’s requirements, namely maximum operational reliability and minimum weight for use at sea. The family-run company, AS-Schneider, was founded in 1875 and with over 350 employees, is one of the leading manufacturers of Instrumentation Valves and Manifolds worldwide. In the market segment for Large-Bore Diesel Engine Valves such as those used in marine propulsion and the generation of electricity, AS-Schneider is even the world market leader. It has its own subsidiaries in Romania, Singapore, Dubai (UAE) and Houston (USA) and professional partners in more than 20 countries worldwide.